The Live-Production Online Directory is updated continously and features as of today 472 OB Trucks from all around the world. 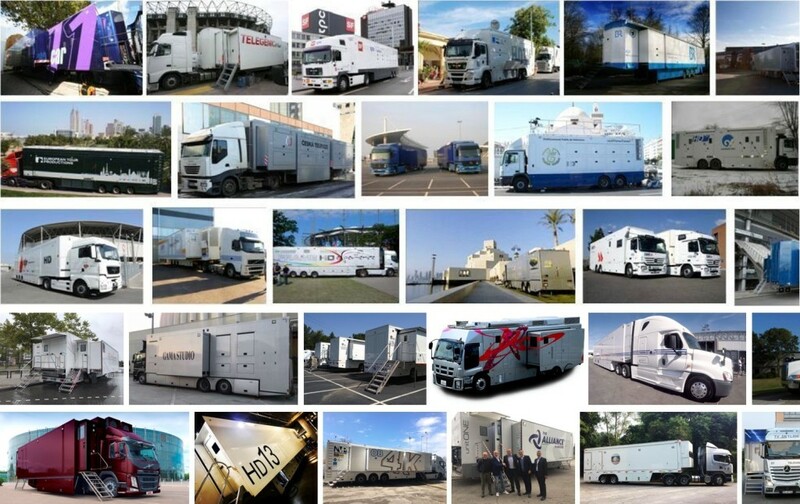 By the end of this year we will present more than 500 OB Trucks, stay tuned. Please find in today's NewsLetter the links to the latest ten additions to the directory. Fuji Media taped the Japanese event of the World Wrestling Entertainment with two broadcast TV trucks and Mobile Audio Units including 11 cameras, 12 VTR and 2 LSM. Also the television show, “I Survived A Japanese Game Show,” was covered by Fuji Media (including Camera X 10, VTR X 6 and Jib X2) at TOHO studio for 3 weeks, as well as managing the technical aspects of the show contestants’ living arrangements on location. From the Roppongi Hills Arena Fuji Media delivered the SPIDERMAN 3 World Premiere with two broadcast TV trucks and Mobile Audio Units including 13 cameras, 10 VTR and 2 LSM. High Rock 1, the newest Super Stallion Dual Stage Expansion Class mobile production vehicle built by Gerling and Associates, Inc. is every production company's solution for bringing entertainment to life. Whether it be Sports, News, or Corporate Events, High Rock 1 combines its small on-site footprint with high power technology to make every project an ease. With technical integration provided by Bennett Systems, High Rock 1 is equipped with a Grass Valley Kayenne Switcher, SONY HDC17000Ls and HDC4300 Super Slo-Motion Production Cameras, EVS XT3 Servers, Calrec Artemis Audio Console and more. Levira is one of the largest TV play-out service providers in Northern Europe and the largest Outside Broadcast service provider in Baltic’s. Levira has three HD OB trucks and UAV (drone) for live TV production. Levira’s customers include multinational and regional IT companies and broadcasters like Turner, Sony, MTG, EBU, ERR, Discovery, ATEA, A-Data, TeliaSonera, Tele2, Elisa, Starman, TV3. Levira manages clients’ critical service chains, which bring the TV and radio programmes, video files, ERP and other services to the end users. Our solutions focus on customers’ needs and are integrated with their service chains. Our clients – leading telecoms, broadcasting corporations, government agencies and companies – expect high service continuity, quality and flexibility from us. HD13 and HD14 are the company’s third purpose-built 4K outside broadcast vehicles They are equal in size, technical capabilities and work environment to HD11, which NEP launched in August 2014. HD13 and HD14 are unmatched by any other mobile production facilities in Australia. They are equipped with Sony’s HDC4300 4K and high-speed camera technology, bringing to more than 70 the number of these camera units in NEP’s fleet. HD13 and HD14 launched early 2017, ready for the 2017 AFL and NRL seasons, and further enhancing the NEP Australia fleet. Each truck creates 65m2 of internal space, 34 seats, 9 Rec/Replay, 7 CCU, 2 TD/BE, 3 Audio, 13 Production Gallery. Premier content producers across the broadcast and live events industries turn to NEP to help them bring entertainment to life. We provide the technology and know-how that enables our clients to capture and display productions on any platform around the world. SSCBS in one of NEP’s next generation HD, 4K-capable OBs. Based in the United States, this extremely powerful 4-unit-truck has the space, infrastructure, and flexibility to handle the largest and most complex productions on TV. With operations around the globe, NEP is everywhere you need to be, with the experience and resources to make your broadcast or event a success. Nataliano Pintabona, Founder, Owner and General Manager at NVP commented, “Our new OB van ranks amongst the most technologically advanced production units in Europe and is recognized primarly for its technical and operational efficiency. We use it for the most challenging productions all over Europe. SAM’s technology is a critical piece of the puzzle when it comes to meeting the evolving requirements in the market place. The new truck means we are capable of producing SD, HD, UHD, SDR and HDR video, as well as leveraging the latest technologies such as IP. One Group of companies for just one Alliance. Gather the three most prestigious European brands in the television production industry, to create one, unique reality: this is The Alliance. A new Company ready to offer to its customers unlimited television facilities, with the experience, the know-how and the capability that only The Alliance can guarantee. The Alliance is the brand of the company created in 2016, merging the 30 years of experiences in broadcast production of three well-known companies operating in European market: Global Production, One TV and SBP. Today The Alliance represent the greater TV facilities provider operating in Italy, established in Milano head-quarter and in Padova, Torino and Roma warehouses. TV Globo’s OBVan has a unique 4K system totally IP-based in 10Gb and 40Gb FO, using COTS IP Switches, where our 4K cameras and replays delivers its signals through NMI to our matrix and both ours 4K switcher. The OBVan also features a fully featured SDI signal layer that we can use to produce in HD-SDI and also serves as disaster recovery for the IP layer.Another unique feature is our Super SloMo system composed of 3 Sony HDC-4800 cameras equipped with 35mm sensor and Canon CN20x50 lenses, which can produce a 8x 4K SloMo replay, and works integrated to Sony's Replay System - PWS-4500 - through SharePlay operation. This operation utilizes file sharing over a single network linking both products. vsmSOUL provides the central service for stream routing and resource management across single-switch, spine-leaf, or mesh network infrastructures. Through vsmStudio, it provides a unified northbound matrix representation of the network towards an overall control system. Using standardized or vendor-specific APIs, vsmSOUL accesses switches and network components, including encoding and decoding devices, cameras, multiviewers, processors, switchers, consoles, etc, to directly control the generation, registration, routing and monitoring of streams. More signals, IP, SDI, 12G, AES-67, UHD, HD, HDR, WCG, OTT, VOD, VR, remote production… the list of innovations and technologies to cope with seems endless. SAM has engineered products that solve the complexity dilemma. In the heat of battle the way replay operators work together can have a massive impact on production values. The way cameras are grouped together for replay shouldn’t be determined by the limitations of your recording technology vendor. SAM gives you the choice of which clips go on the output timeline while at the same time the program director can make immediate decisions on what to replay. A History of Firsts: In 1980, BET (Black Entertainment Television) became the first television network in the United States primarily devoted to African-American viewers. In 1991, the network’s then-parent company became the first black-owned company to be traded on the New York Stock Exchange. And recently, the network scored another first, this time in technology adoption – enabling it to stake its claim among the pioneers of IP-based production workflows. Each June, the Los Angeles Convention Center and LA Live event complex come alive with the BET Experience, an annual festival of music, entertainment and fan activities surrounding the BET Awards.